Basically, the last two days in the FTSE are exactly in keeping with what we highlighted in our last comment last Thursday, the 22nd; “As you can see 6950 is now DR, which also hides the threat that 6950-7050 may become the next zone. This highlights one of the problems with such a massive expiry, as the shoulders either side of the existing zone are so large, they can mask any potential move, and if it does happen this also means it can be rather dramatic. Now, as you can see from the table above, the zone still hasn’t moved, but it is still very likely to, especially now for two main reasons. First, the “extra” week is up and we are now into the more normal 4-week timetable. Secondly, activity was virtually non-existent, and only just managed to achieve the lowest possible level, and this can’t continue much longer. The market knows what is waiting for it at 6900, and the close at 6952.86 we don’t see as a coincidence, so if the zone does change, and it is acting as if it already has to us, then it is clear up to 7050. For the DAX there has been no problem with its zone, and as we commented last time; “The big question here is also the zone, but here it is trapped a lot higher up. However, the appearance of 500-points of Y ratio means it will move, and one has to assume to 11450-11550”. Furthermore, it is just the zone that has moved as around it the ratios are virtually unchanged, despite the impressive level of activity. 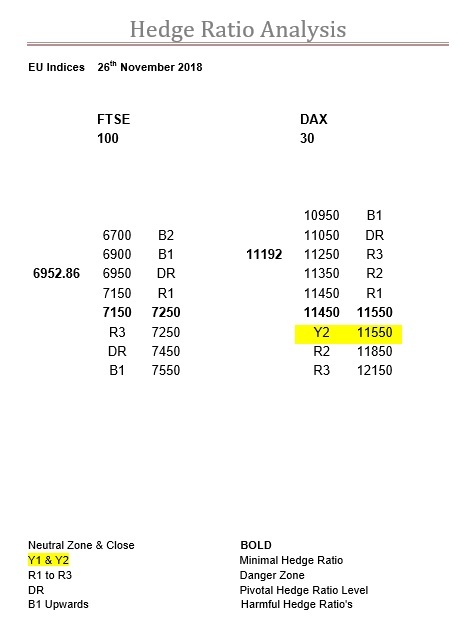 The most obvious is the Y ratio bandwidth now flips to above the new zone, but below it the only ratio to change is DR which has slipped from 11150 to 11050. However, as this has only just occurred, and is therefore just below the threshold, it still represents a considerable “step-up” in the level of ratio, so it will definitely still cause issues with its dynamic delta affect. But, at the end of the day, 11250 is still the main problem as is what is happening in the US. However, given a clean run, 11250 is far less a hurdle than 11050 is in the other direction.